As a child of the 70’s, I grew up watching crime dramas and some of the most memorable ones revolved one main character, Columbo, McCloud, Barnaby Jones, Mannix, Ironside and my personal favourite, Police Woman. These characters seemed to magically solve the crime, without the assistance of anyone of importance. Clues fell into their lap and evidence magically appeared. If you look at shows that are popular now, you will find the likes of C.S.I where a team of experts is needed to solve the crime. They rely on each other and spend a great deal of time communicating their thinking throughout the mystery. 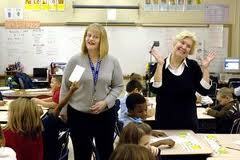 Likewise, gone are the days of teachers working in isolation trying to meet the diverse needs of their students. The best teaching and learning occurs when we call upon the strengths of a team approach. This past week, our primary teachers took part in a collaborative inquiry learning model whereby they collaboratively planned a numeracy lesson, taught it with a partner and then took the time to debrief about their observations and next steps. The excitement was evident as they shared their “co-learning” with their students. Teachers need to talk about our teaching, just as we need to ensure that we are providing our students with time to talk about their learning.